UPDATE: TRECAN no longer holds a 49% interest, Matamec has now partnered with Ressources Quebec who holds a 28% interest. Mine lifespan estimated at 15.2 years plus preproduction (1-2 years), however Matamec has stated there is potential for additional resources that could increase this lifespan. 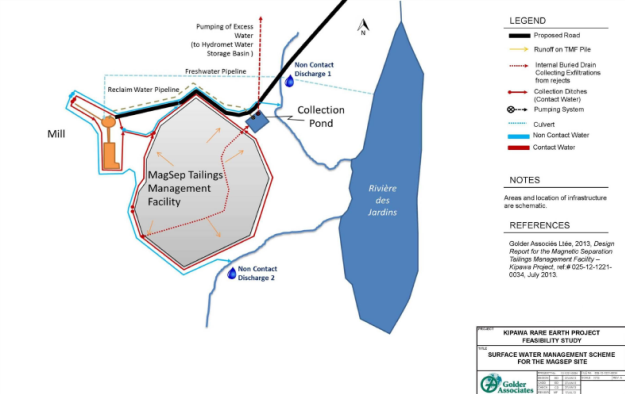 UPDATE: Projected timelines have changed, at the earliest construction is expected to start in 2017 with the mine opening in 2018. Preproduction year will involve clear-cutting of the vegetation and removal of 1,328,480 tonnes of overburden as well as 130,760 tonnes of top soil. Mine will operate 361 days per year. Mill feed will operate 365 days per year. Mine will feed the mill with 3650 tonnes of ore per day. Drilling will occur day and night. 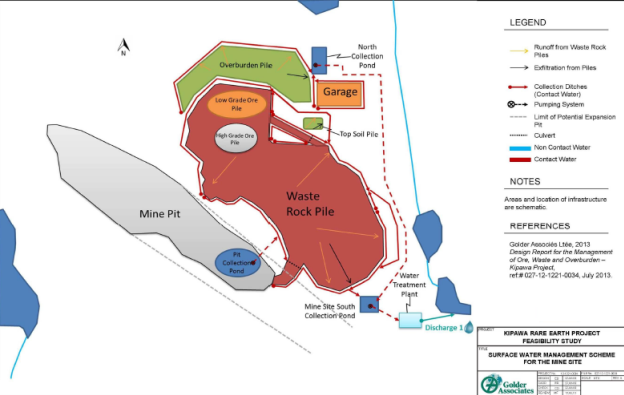 18.65 Mt of waste rock produced and stored in 2 piles plus a 3rd ‘in-pit’ waste storage will be used during the last 3 years of the mining operations (year 12-15). 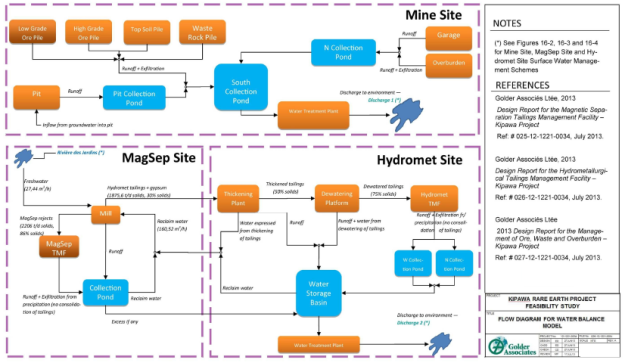 Hydromet tailing - produced from the hydrometallurgical processing which involves acid leaching, neutralization, removal of impurities and a final precipitation to produce the rare earth concentrate. 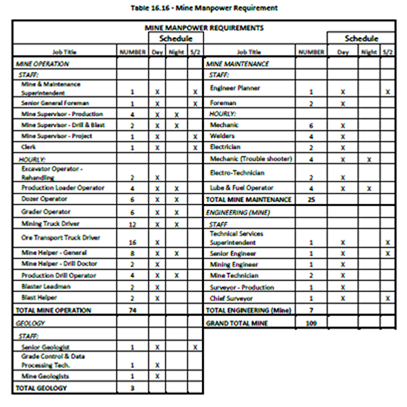 Some waste rock and most of ore samples exceeded NORM (Canadian guidelines for Management of Naturally Occurring Radioactive Materials) criteria. Tailings from magnetic separation found to be leachable for lead, selenium and zinc. They exceed NORM criteria. 2 pumping stations Sheffield Lake and Desjardins River. Both sites will have a main building and electrical room. Maximum daily pumping from pit has been estimated at 900 m3 per day. Seismic activity of the project site is higher than the average for the Province of Quebec. Historic seismic activity for the area includes 16 recorded earthquakes (between 1980 and 2000) of magnitudes of 4 or greater on the Richter scale. An earthquake of 6.2 impacted the region in 1932. 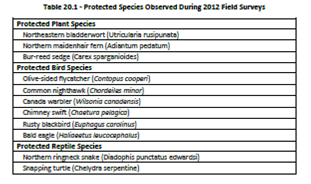 Field surveys in 2012 identified many protected, vulnerable and threatened species. 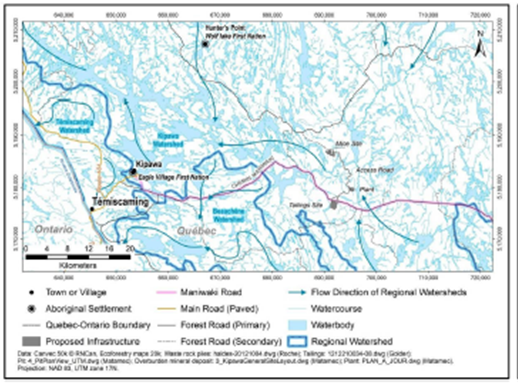 Land is used by Aboriginal and non-Aboriginal people for hunting, fishing, trapping, canoeing (vast system of canoe routes) and recreational uses (a large number of public land leases for camps and cottages near the mine infrastructure). 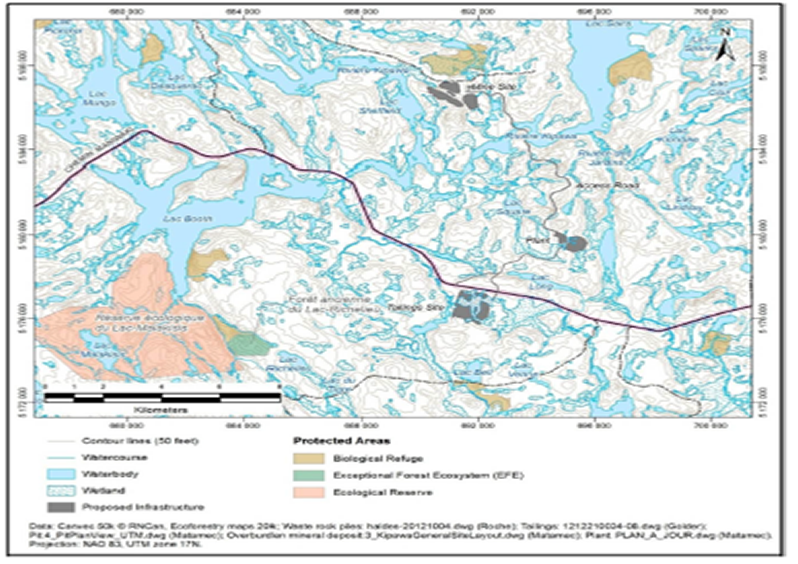 Vegetation (mixed forest stands) and wetlands lost by clear-cutting and constuction of infrastructure, mine site, process plan site, tailings storage and access roads. Loss and modification of fish habitat due to infrastructure and associated changes in hydrology, hydraulics and water quality. Alterations of spawning grounds for Walleye, Lake Trout, Brook Trout due to sedimentation. Fish habitat loss. Local population is 3,350, projected employment opportunities 109 non-unionized workforce. Many of these positions require specific skill sets, education or training. If 100% of the opportunities went to local residents this represents 3% of the local population.